In the second quarter of this year, 63.4 percent of the households in the U.S. were homeowners, marking the lowest rate of home ownership since 1967, nearly 50 years ago, according to data just released by the U.S. Census Bureau. The homeownership rate fell from 63.7 percent in the prior quarter and from 64.7 percent a year ago and now remains just just one-half of one percent from the all time low of 62.9 percent in 1965. 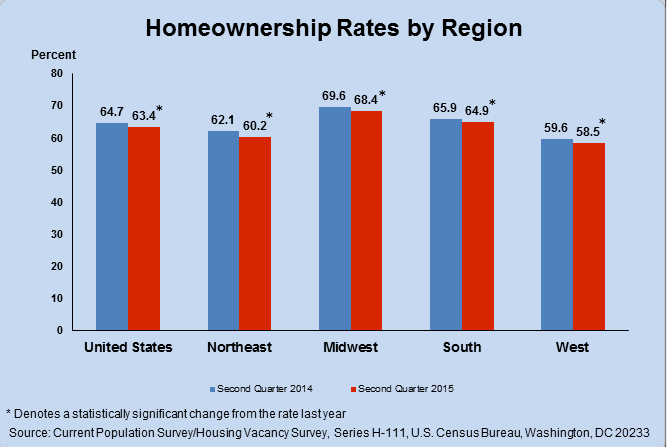 As the regional chart below shows, the midwest region of the U.S., at 68.4 percent, has the highest rate of homeownership of the four regions, followed by the south at 64.9 percent. Not surprisingly, the region with the lowest rate of homeownership is also the region with some of the highest home prices, the west.